15/06/2015 – The OECD and the Government of the Kingdom of Morocco today signed a Memorandum of Understanding on a two-year Country Programme which will support Morocco’s reform agenda. This agreement signed in Paris by OECD Secretary-General Mr. Angel Gurría and Mr. Abdel-Ilah Benkiran, Head of Government of the Kingdom of Morocco is a major step towards the reinforcement of the collaboration between Morocco and the OECD. The Country Programme is a new OECD tool that enables some partner economies to leverage OECD expertise and best practices, strengthen institutions, and build capacity for successful policy reforms. Morocco is one of three partner economies along with Kazakhstan and Peru, which have been selected for this bilateral work programme that covers areas such as investment, trade, public governance, education and employment. 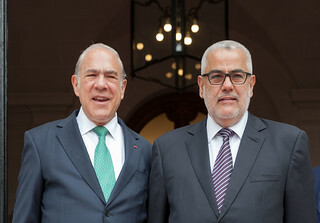 15 June 2015 - (From right) Abdelilah Benkirane, Head of the Government of Morocco with Angel Gurria, OECD Secretary-General. Paris, France. The Country Programme for Morocco consists of 17 policy reviews, adhesion to 9 OECD legal instruments and reinforced participation to 9 OECD bodies. It is built around three main policy areas: economic growth and competitiveness, social inclusion and public governance. This set of activities will give Morocco access to key information and recommendations to develop and bolster its reform agenda over the next two years in order to support strong, inclusive and sustainable growth. For comment or further information, please contact Mr. Carlos Conde, Head of the Middle East and Africa Division, OECD Global Relations Secretariat (GRS).